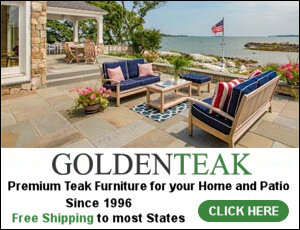 Living in New York City but vacationing every year in St. Augustine, Florida, this homeowner waited for the right time to have her dream beach cottage go up for sale, and after years of loving it from the distance, she could finally buy it. 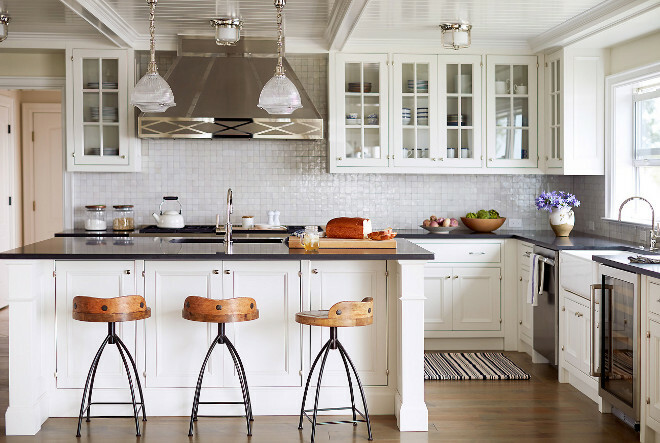 The waterfront location of the cottage was really what made this homeowner fall in love with it but the interiors were far from being what she wanted. To bring her personality and taste to the space, she hired one of my favorite Florida interior designers, Andrew Howard from Andrew Howard Interior Design. Andrew brought a heavy dose of Hamptons charm into the cottage, making the home feel more welcoming, comfortable and full of character. 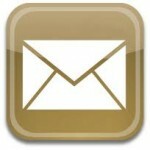 Take notes on the sources shared by the designer and make sure to pin or save the images. 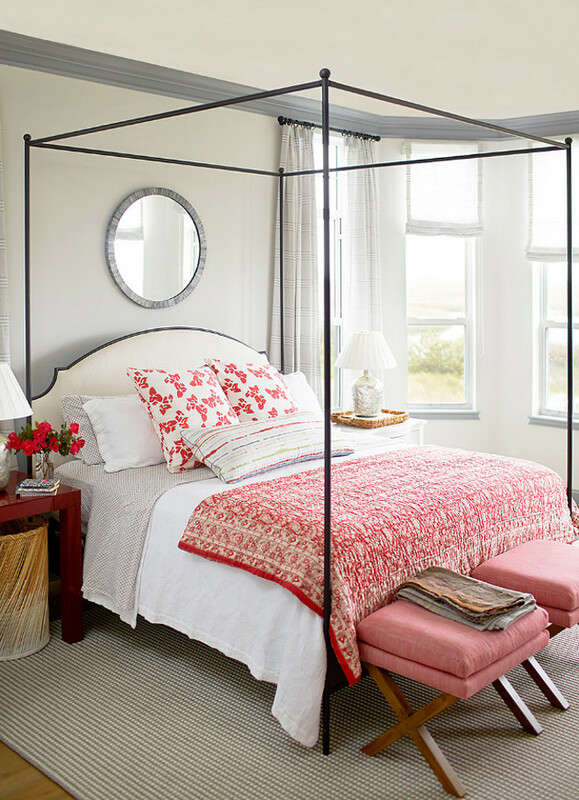 There’s plenty to learn and get inspired by these beautiful coastal interiors! 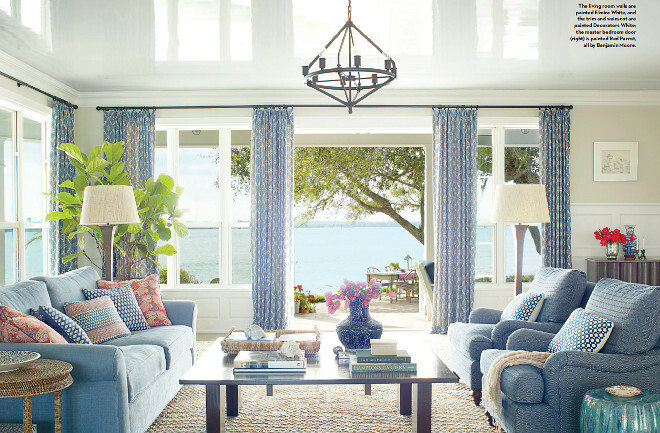 This waterfront living room is perfect for entertaining or relax with a good book. Sofa: Blue English arm sofa and chairs are from Baker Furniture. 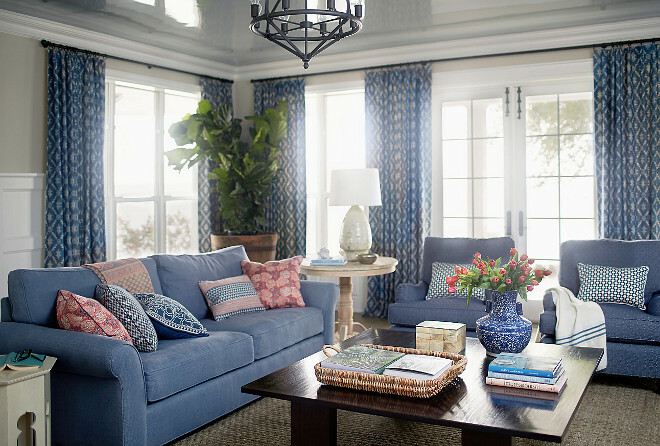 The Hugo Blue sofa fabric is from Colefax & Fowler. Blue diamond chair fabric is by Robert Allen. Gray jute rug is by Merida Meridian Inc.
Large end table and garden stool in from Mrs. Howard. Coffee table is custom. Drapery fabric is Mansfield Lake by Kerry Joyce. Lighting is from Visual Comfort. 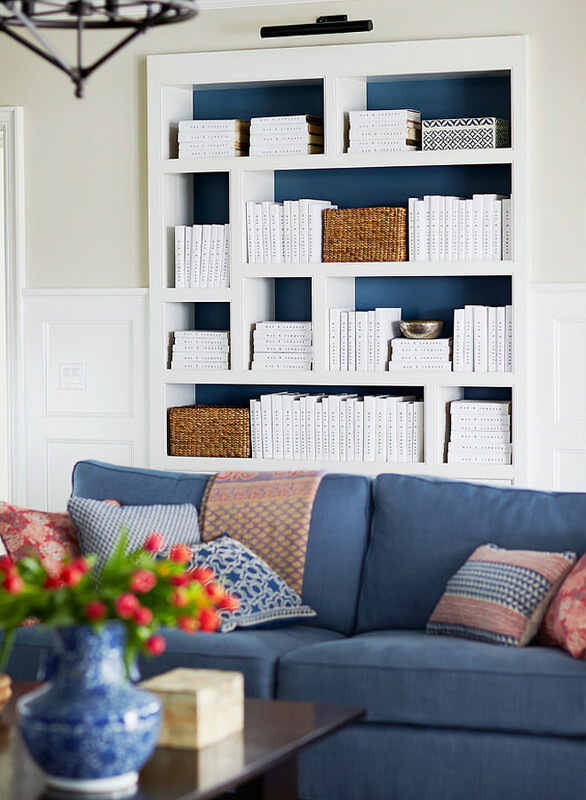 The living room also features a white bookcase with back painted in navy, and decorated with woven baskets and white books. Living room wall paint color is Benjamin Moore Elmira White. Trim and wainscoting paint color is Benjamin Moore Decorator’s White. 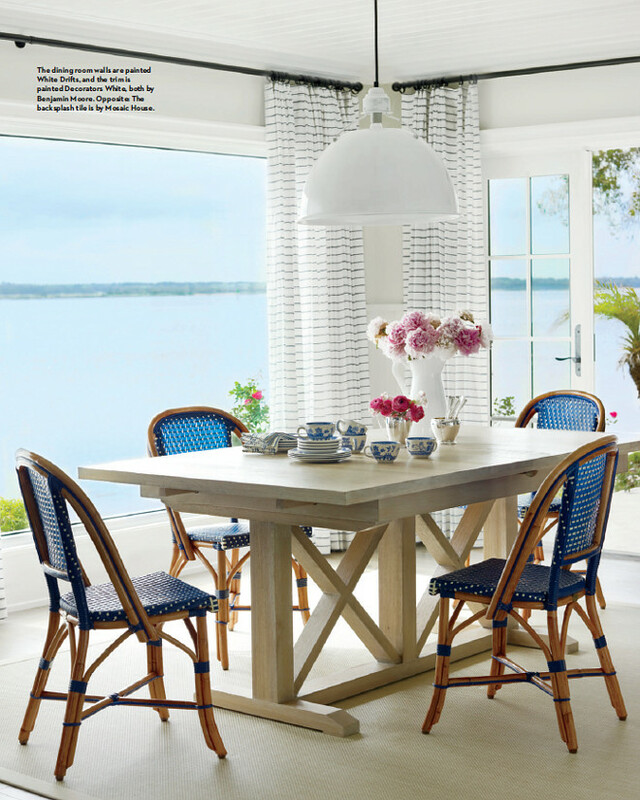 Photo by Francesco Lagnese for Coastal Living. What a view! Can you picture yourself here? Woven Shantell rug is from Stark. 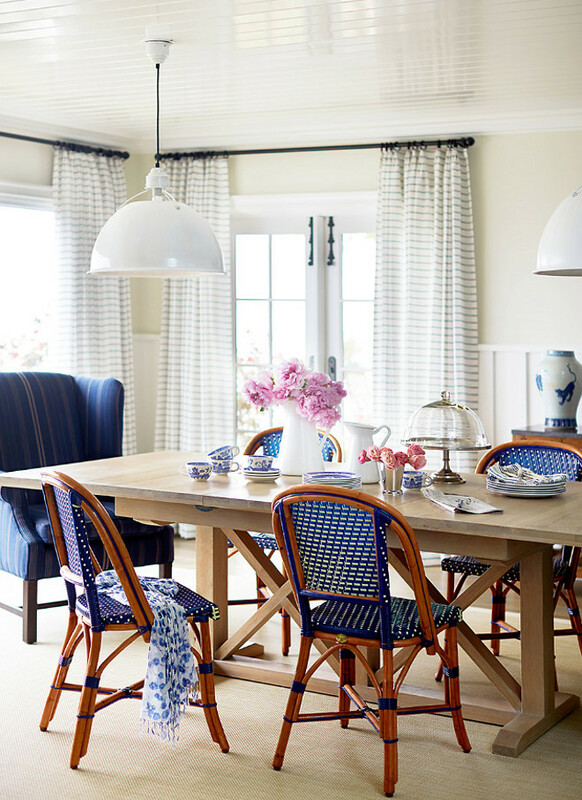 Oak table is custom and the French bistro chairs are from Decor-n-More. 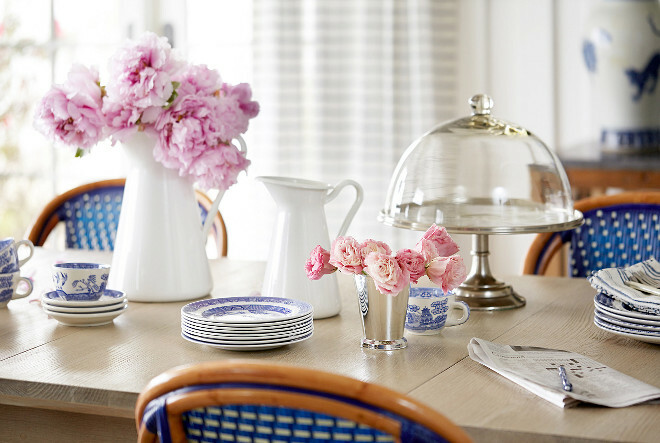 Striped drapery fabric is Lateral Marine from Kravet. The dining room wall paint color is Benjamin Moore White Drifts. Trim paint color is Benjamin Moore Decorator’s White. 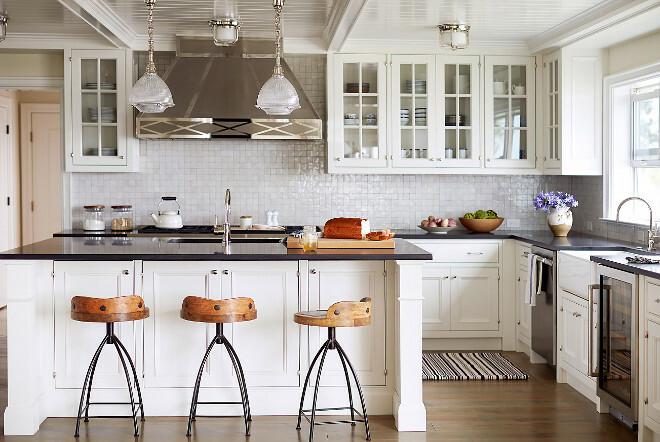 from a mold of an antique pull and a gorgeous custom stainless steel range hood. Wall paint color is White Drifts by Benjamin Moore. Trim, ceiling and cabinets are Benjamin Moore Decorator’s White. Flooring is a warm, driftwood-hued wood planks from The Pine Cottage. The stainless steel hood is from Southeast Stainless Fabricators. The swivel countertstools are from Arteriors. Polished pendants from Visual Comfort. Kitchen faucets are by Watermark. 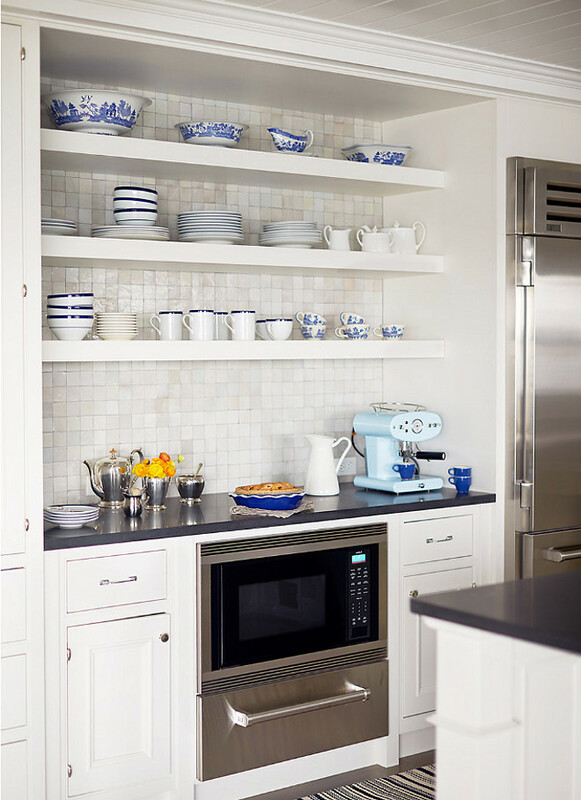 The open shelves display pretty blue-and-white dishware. 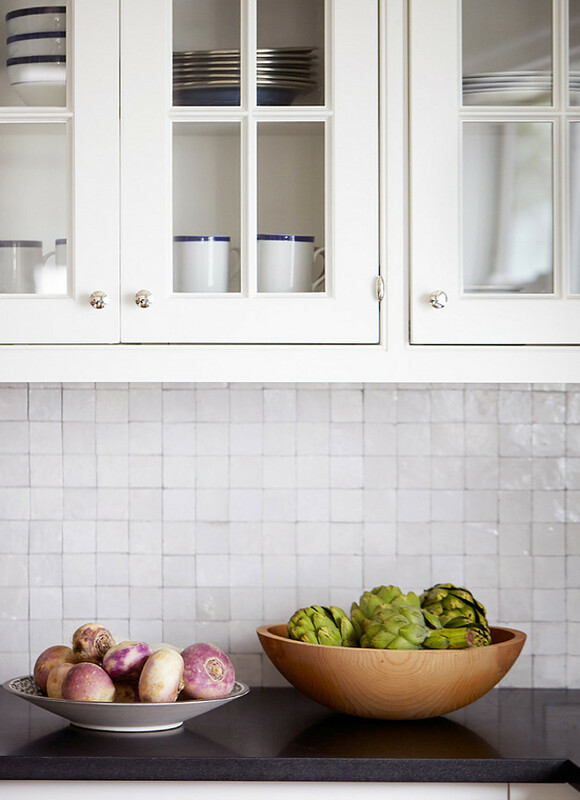 The backsplash is 2×2 squares glazed tiles to look like mother of pearl, made of reclaimed bricks from Mosaic House. Countertop is Black honed granite. 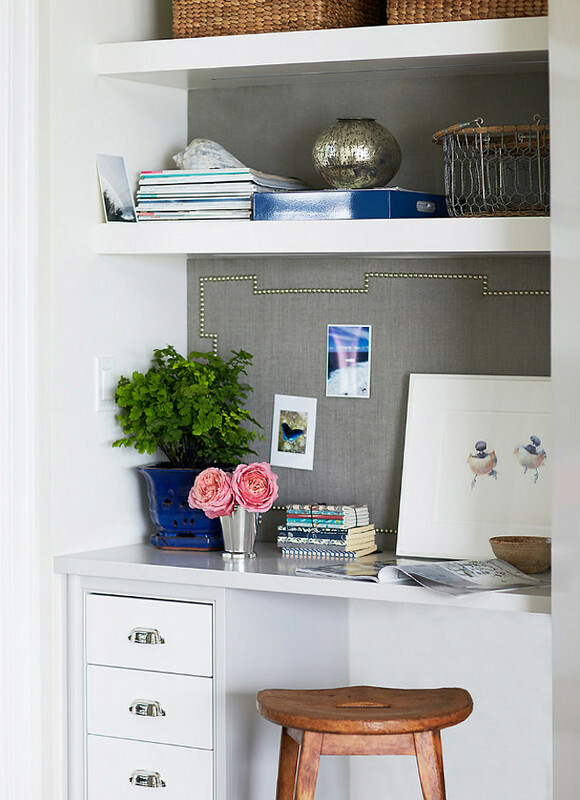 This built-in desk features grey linen memo board and open shelves. 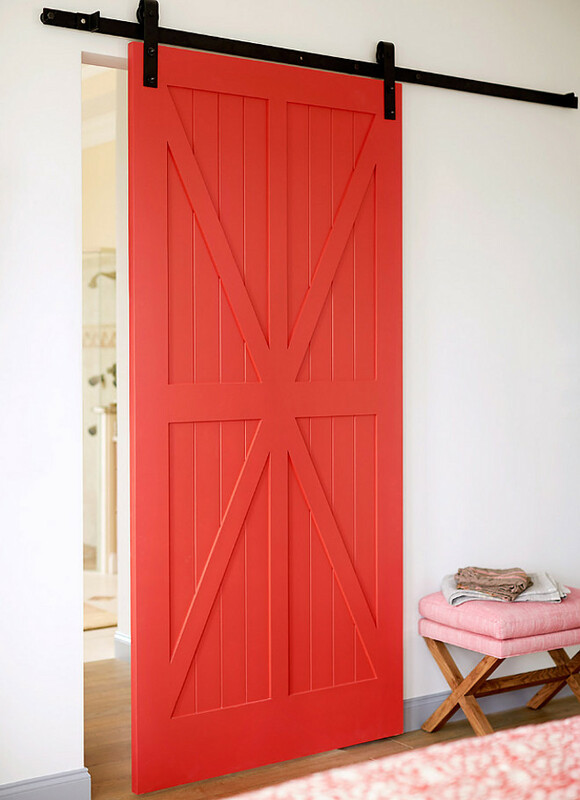 The custom red barn door paint color is Benjamin Moore 1308 Red Parrot. 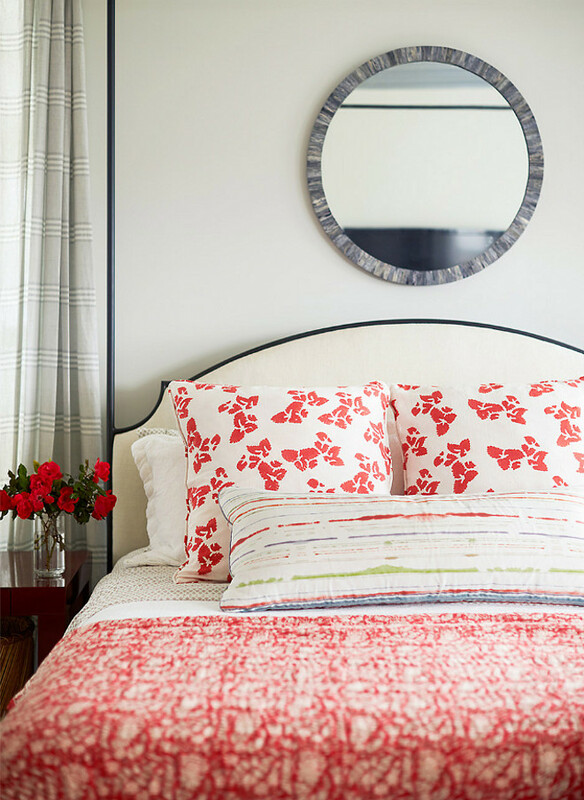 The master bedroom is welcoming and cheerful! The paint color is Paper White by Benjamin Moore. Corvelet and blanket are Kerry Cassil. Geometric print sham fabric, striped pillow fabric, stool upholstery fabric, shade fabric and drapery are from Romo. 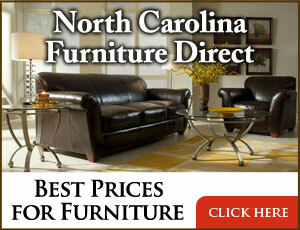 The custom bed was designed by Andrew Howard and the stools are Lee Industries. Round mirror is from Mrs. Howard. Remaining Photos: Stacey Van Berkel. What a great cottage, huh? I love it! I hope you have a wonderful day and we’ll talk again very soon!